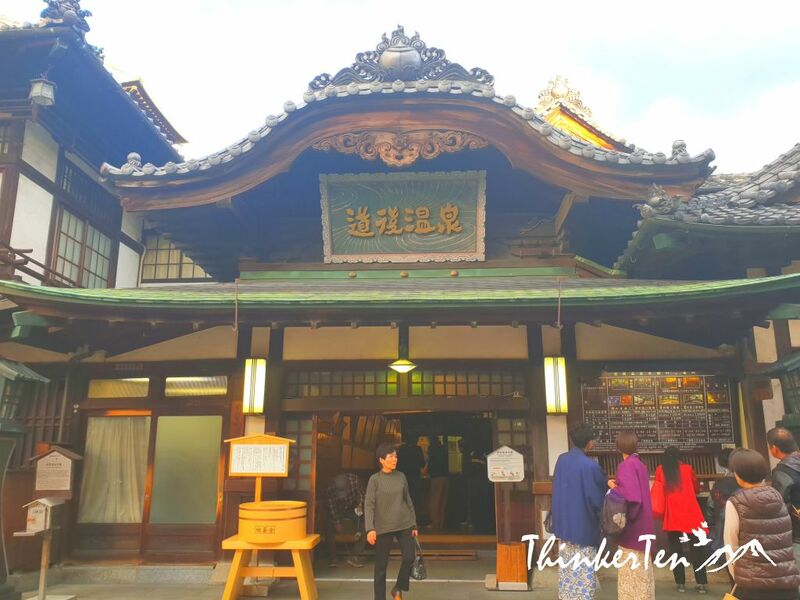 Japan Shikoku : Thousand Years olds Hot Springs – Dogo Onsen Honkan & “Botchan” Natsume Soseki at Matsuyama. Top 16 things not to be missed! Matsuyama is the largest city in Shikuko island and also the capital of Ehime Prefecture. Tourists from everywhere rushed here to take a bath in the oldest hot springs – Dogo Onsen and visit the Botchan Train. 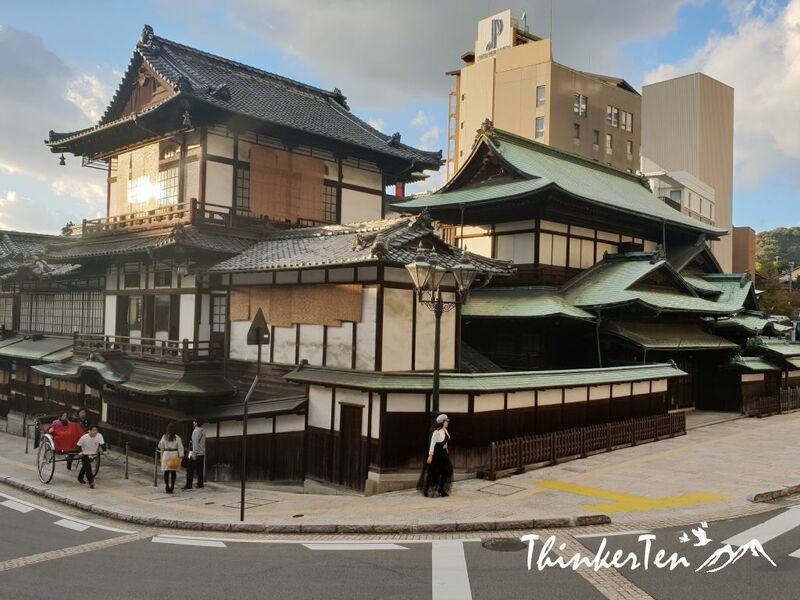 The wooden public bathhouse is oldest bathhouse in Japan, date from 1894. 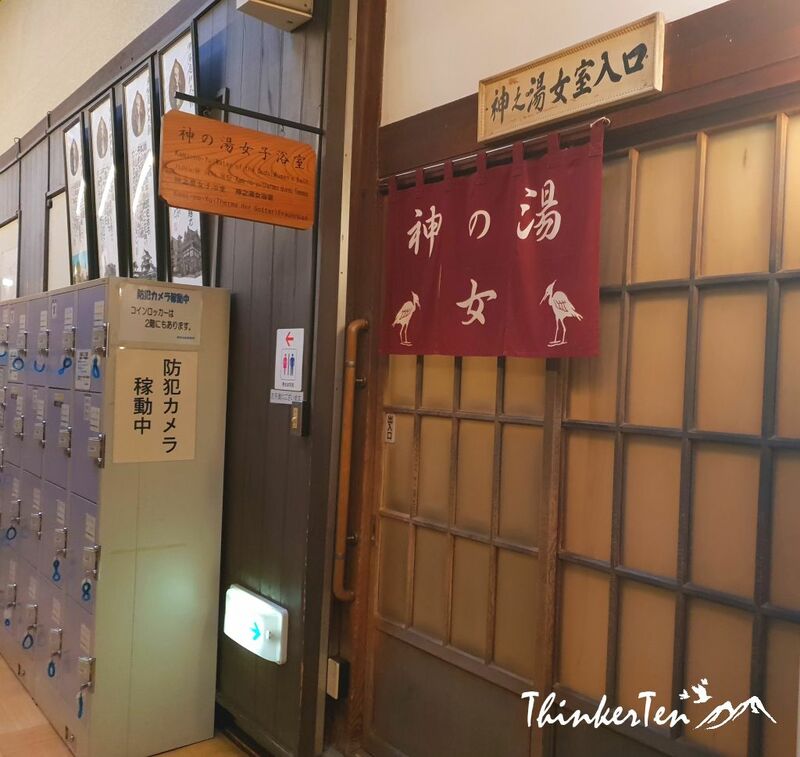 What make Dogo Onsen stand out from the rest of the public bathhouse is it has a “Yushinden” for the Imperial family. 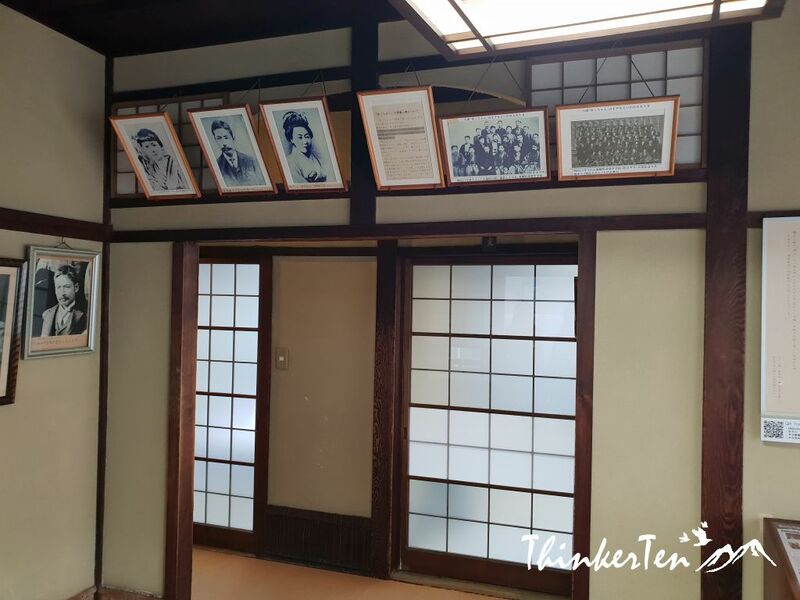 Dating from the Meiji period, the wooden bathhouse was visited by the Imperial family on various occasions. It was well-loved by the locals and one of them was the great Japanese novelist, Natsume Soseki 夏目 漱石, who wrote the masterpiece, “Botchan”. 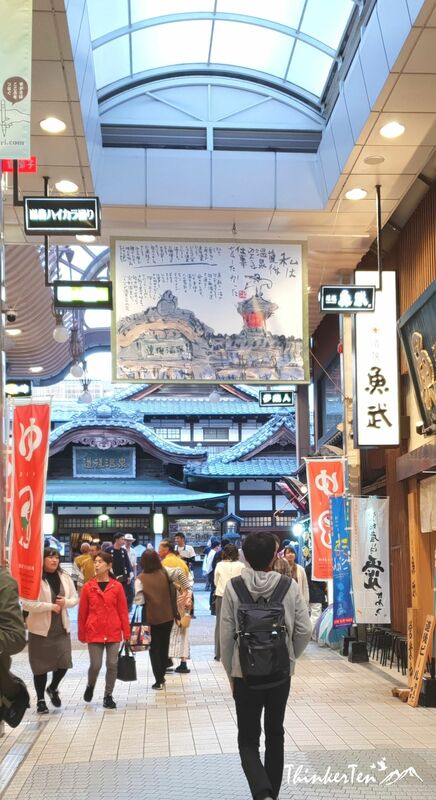 Now locals love to make a pilgrimage to Dogo Onsen. 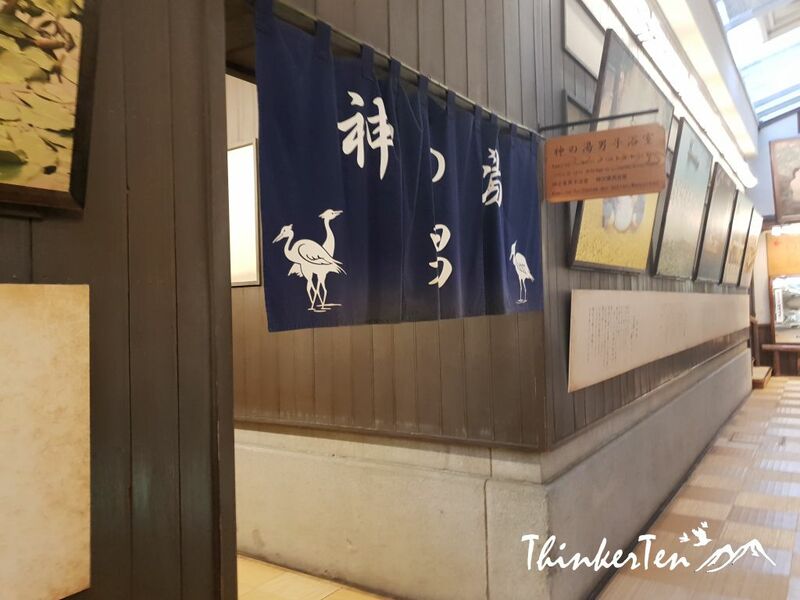 When you walked around Dogo Onsen, you see the symbol used is egret or white herons displayed at the paper sliding door or at the noren/Japanese dividers hung between rooms. According to legend, one of the wounded egret found a hot spring here and socked his wounded feet in the hot water and recovered and became well and flew away happily. People started to soaked in the hot spring and their health too improved and the news spread and the hot spring became popular. The only bathing room in Japan reserved for the imperial family, built in 1899. It was modeled after the architectural style of the Momoyama Period, which was the last phase of the Sengoku Period in the 16th century. This is now a museum at the higher floor. 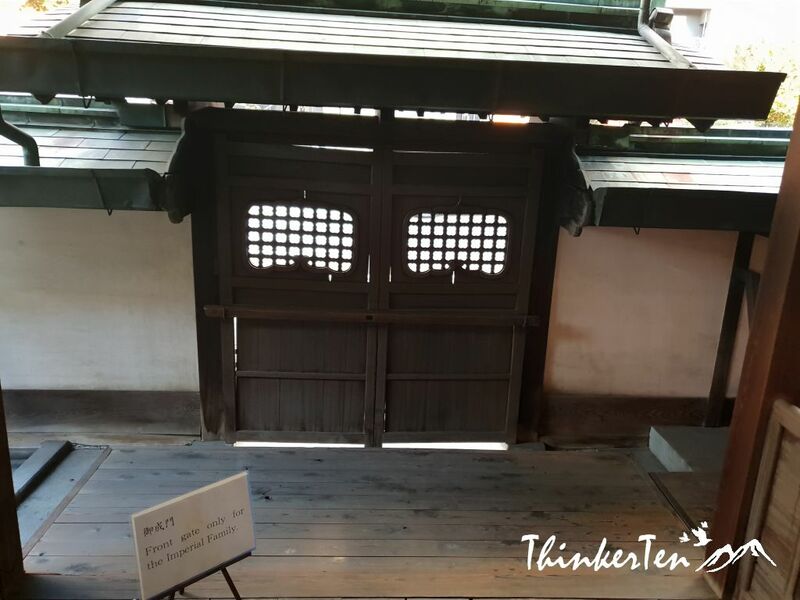 There is a separate entrance (above picture) which is different from the public entrance for the Imperial family when they wanted to visit Dogo Onsen back in the olden days. There are also egrets at the sliding doors (see below). Botchan is a famous novel that is read by every Japanese in Japan during their school year. I learn about Botchan when I was studying in Japan. The story is based on Natsume Soseki who is the author of Botchan own personal experience as a teacher in Matsuyama city in Shikuko. He was born in Tokyo but first time living outside Tokyo, to a countryside in Shikoku so he experience a lot of difference in the countryside of Japan. Natsume Soseki is one of the most famous author in the Japanese literature. 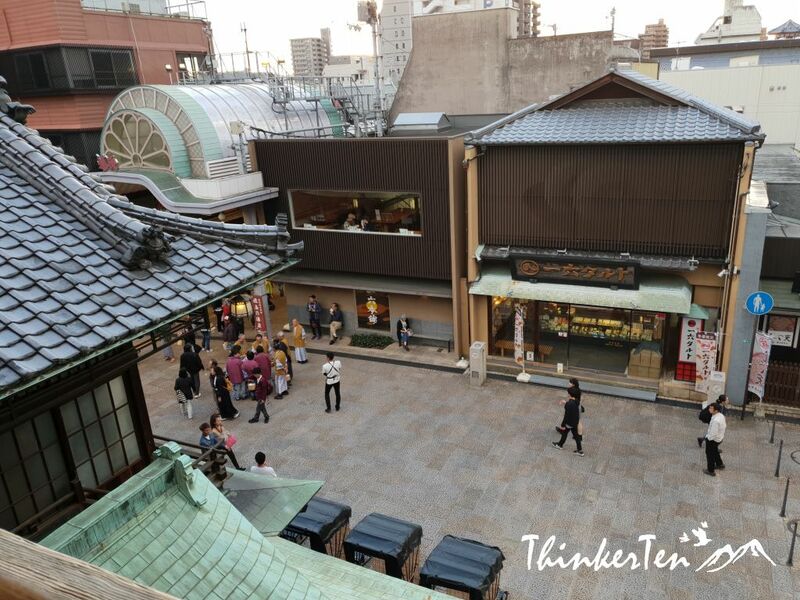 Tama no Ishi is located outside of the building of Dogo Onsen. 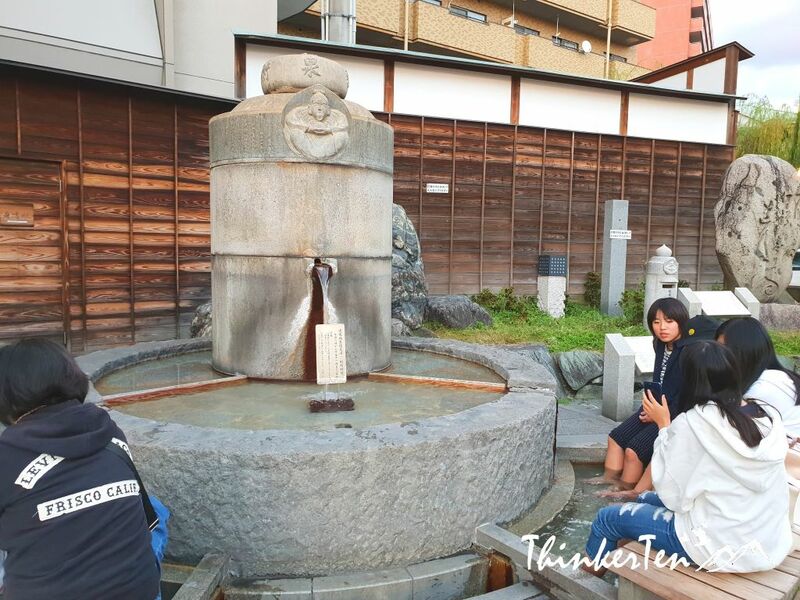 The big stone here has another legend for Dogo Onsen. Long long time, there are two gods called Okuninushi no Mikoto 大国魂命 and Sukunahikona no Mikoto 少彦名命. Sukunahikona no Mikoto had a bad illness so Okuninushi no Mikoto made Sukunahikona no Mikoto to soak in the hot spring and became well again. At the same time, his footprint was left and here is now a big stone called “Tama no Ishi”. 6. Animate by Hayao Miyazaki 宮崎 駿 – Spirited Away” (千と千尋の神隠し) – observe the green rooftop! 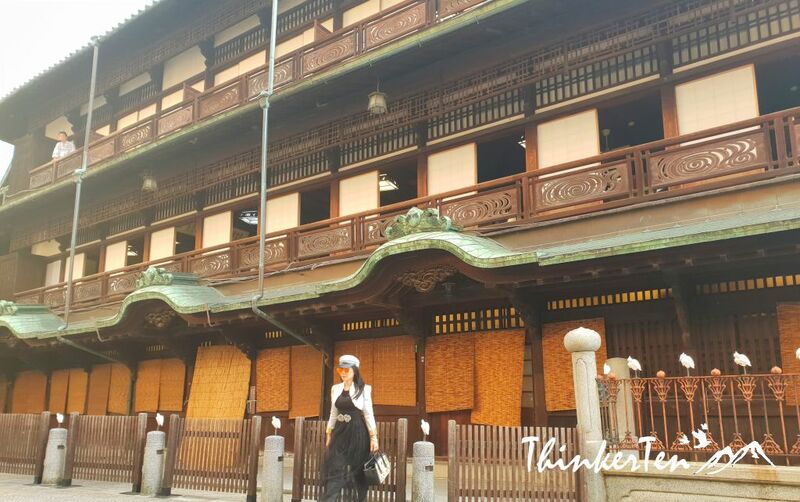 There is another thing about Gogo Onsen that you may notice is the green rooftop and the special shape that you will see in many of the houses from Hayao Miyazaki’s animation – “Spirited Away”. When you look at the entrance ticketing system you may get a shock as it is quite complicated as there are different package for you to choose from. 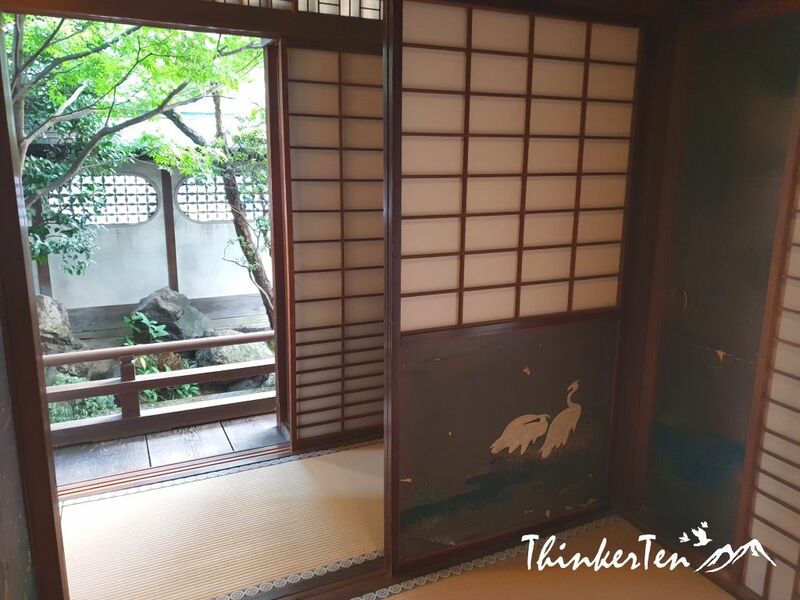 From usual to comprehensive package which include access to a private tatami room on the third floor for relaxation with “Botchan Dango” sweets plus rental of Japanese bath robe/yukata. I didn’t go to the public bath as I prefer to use the hot springs in my hotel resort nearby. My tickets are just for the tour of the Emperor’s bathing facilities (view only no bath JPY 260 , USD 2.30) with a guide who don’t speak any English. He will pass you an English pamphlet to read and point at certain artifacts. Dogo Onsen Station is quite unique, it sits near Dogo Onsen Honkon, just one min walk. 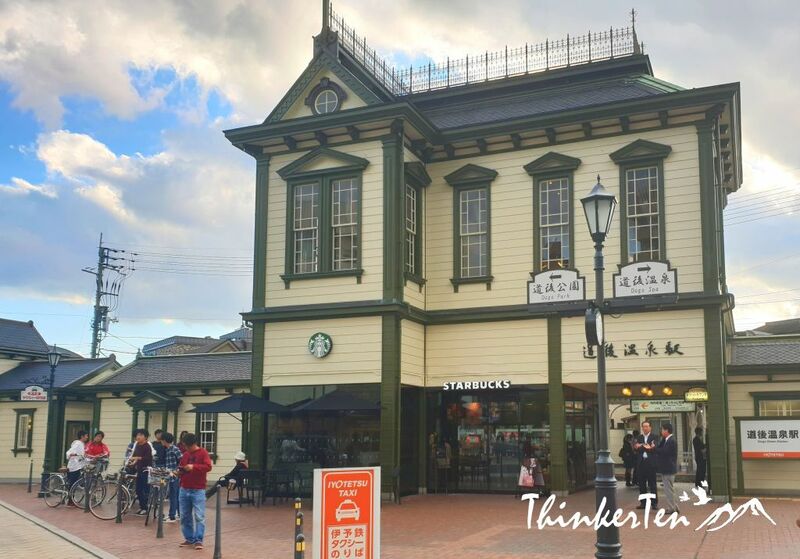 The Dogo Onsen Station is very historical and a good representation of Meiji Period wooden architecture, built back in 1895. 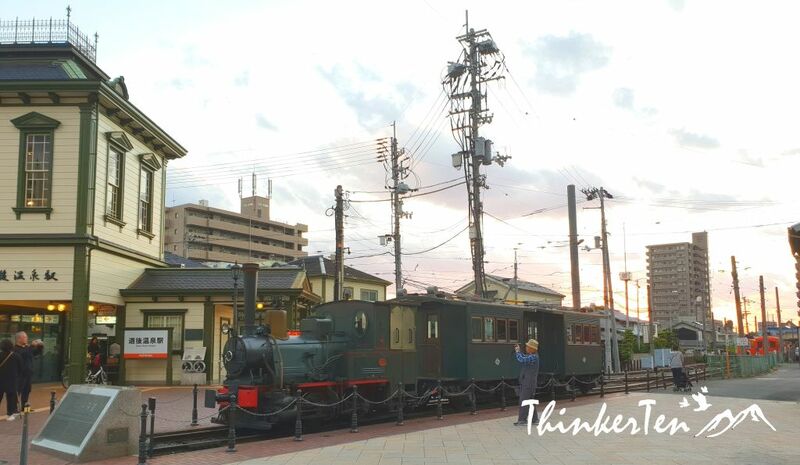 There is the “Botchan Ressha” 坊っちゃん列車, a traditional old steam train which runs from Dogo Onsen Station to Matsuyama city Station and then back again. 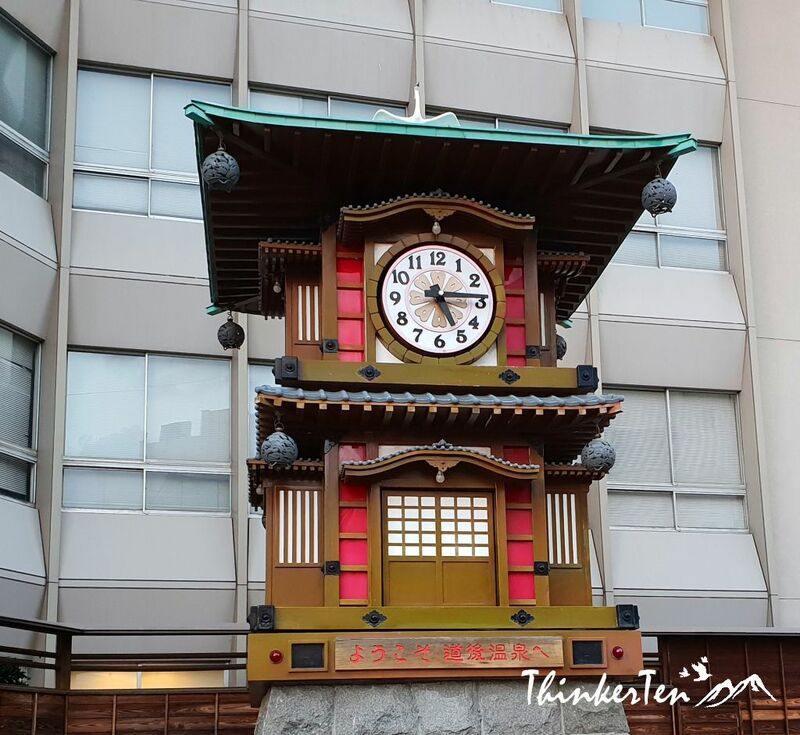 Botchan Karakuri Clock is located very near the Dogo Onsen Station and near the Shotengai/shopping street. Mechanical figures re-enact a scene from Botchan when the clock strikes the hour. 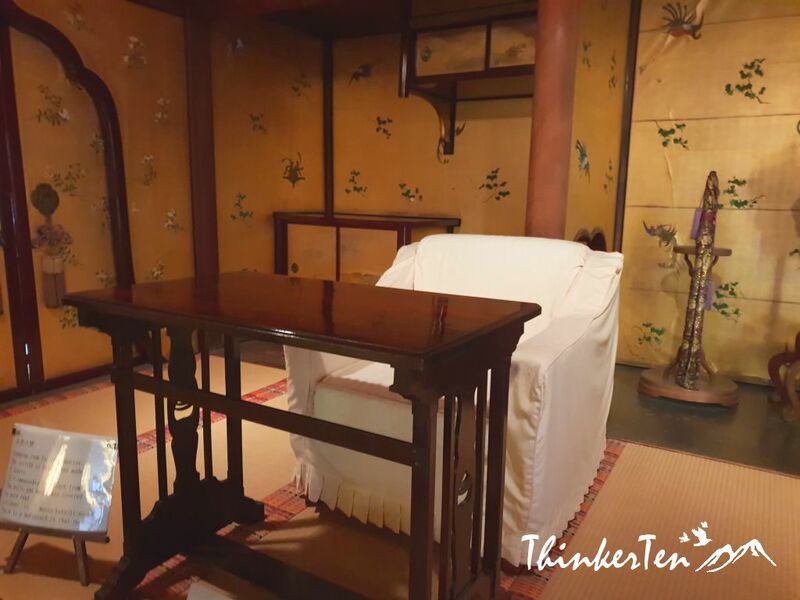 The foot bath onsen/hot spring is located next to the Botchan Karakuri Clock. 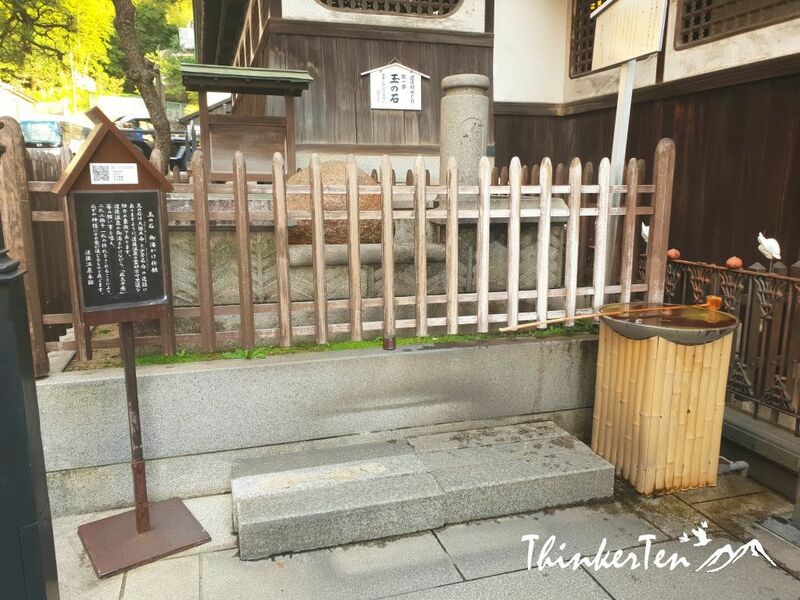 You can enjoy free soaking of warm hot spring water in this little foot bath. Bring along a towel to wipe it dry after your foot bath. 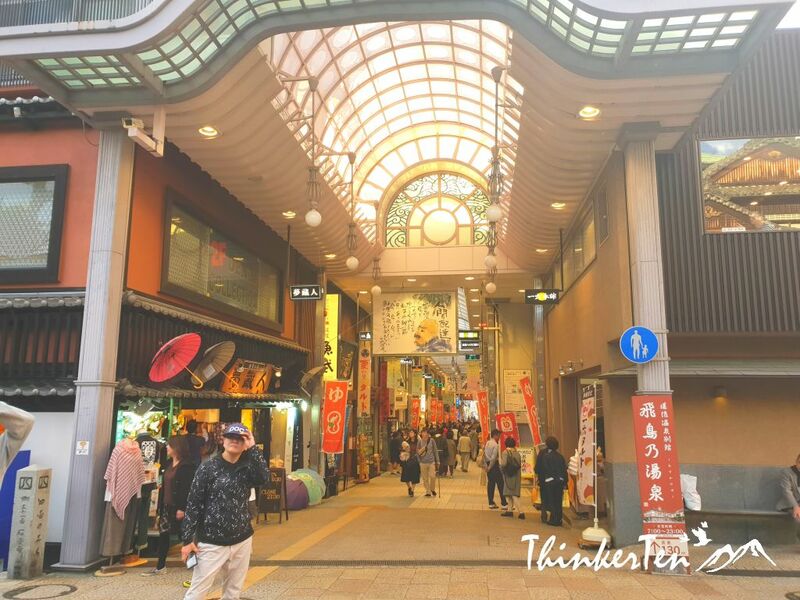 This is also only place where you can still wearing the bathrobe/Japanese Yukata and walk around in the shotengai/shopping streets. You should try out too when you are here in Dogo. The old Japanese men are holding a basket for their towel and keys for their locker. Botchan Dango is tasted similar to the ordinary dango/Japanese sweet dumpling. This is the top souvenir in Dogo Onsen to bring back for family and friends. 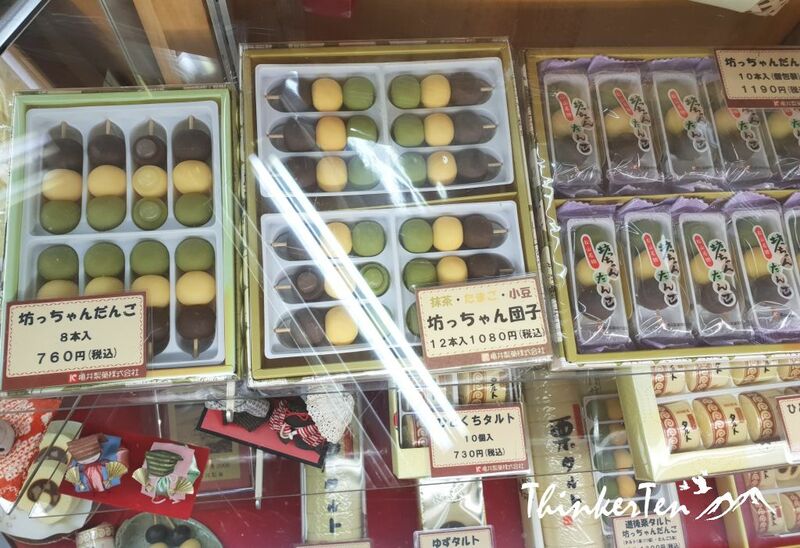 It has 3 colors and 3 different flavor in small balls shape of mochi, coated with bean paste colored with azuki red bean, egg and matcha natural coloring. 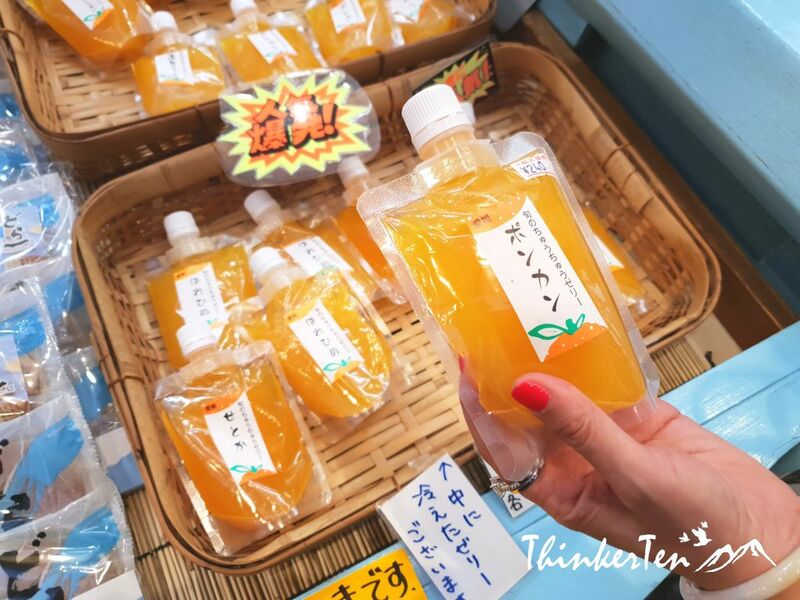 There are plenty of real mandarin oranges in the jelly drinks. A bit sour and not very sweet. The sweet potatoes are served warm, original or coated with chocolate. I choose the original version which is coated with some sugar. Dogo Park is at a different direction from Dogo Onsen, about 5 mins drive from Dogo Onsen. 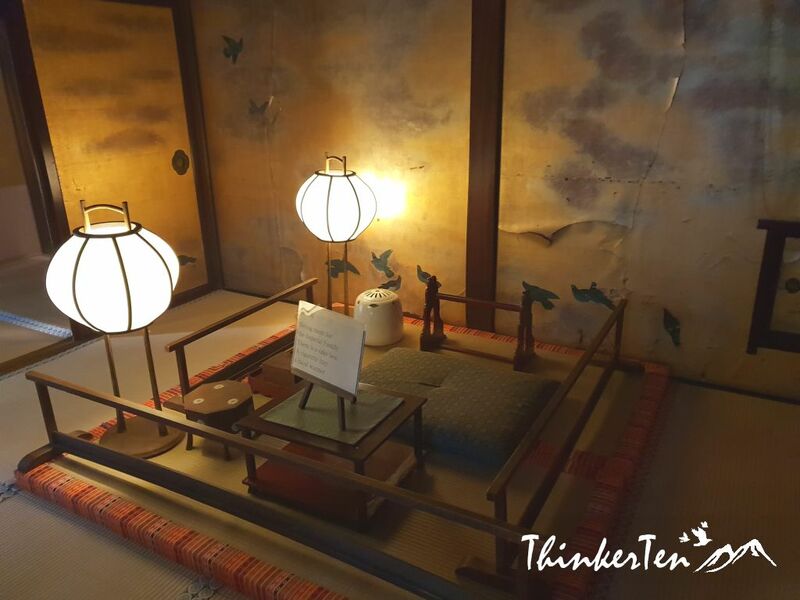 It is another attraction worth to visit if you have extra time to spend in Matsuyama city. 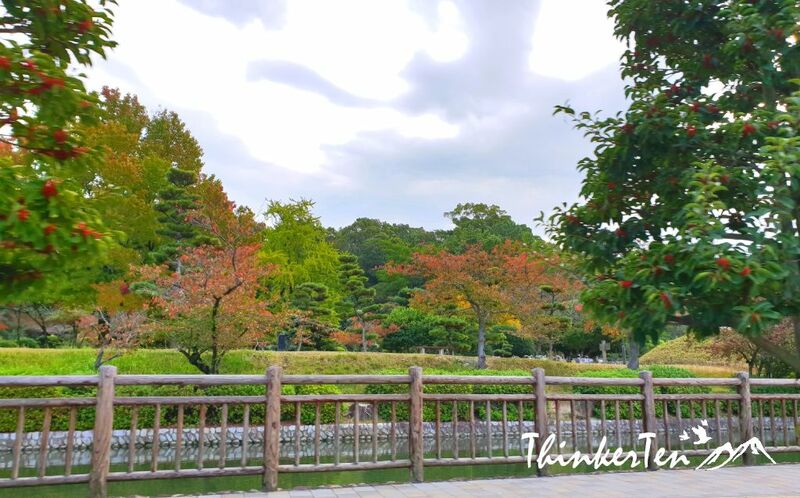 The park was once Yasuki Castle so you see the remains of Yuzuki Castle – the former residence of the Kono clan, the rulers of the Iyo domain in feudal times. The best time to visit is during Sakura blooming season Mar to May. In Autumn, you also see some red leaves/momiji or maples leaves turn red. 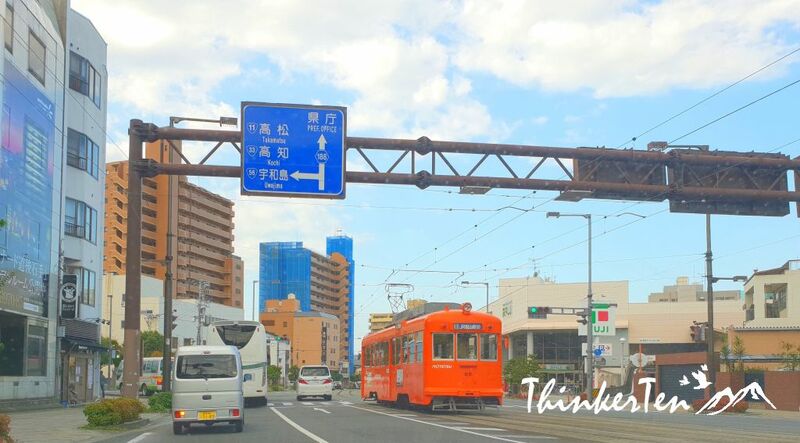 The orange tram is another city highlight in Matsuyama city, the trams are in bright orange color running around Matsuyama city sharing the road with other motor vehicles. 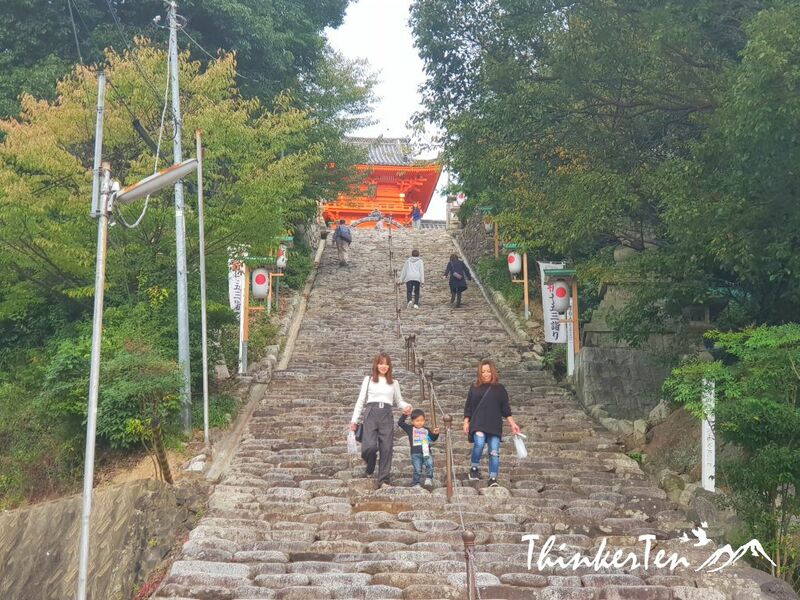 There are about 135 stone steps up to the vermillion shrine, called Isaniwa Shrine. 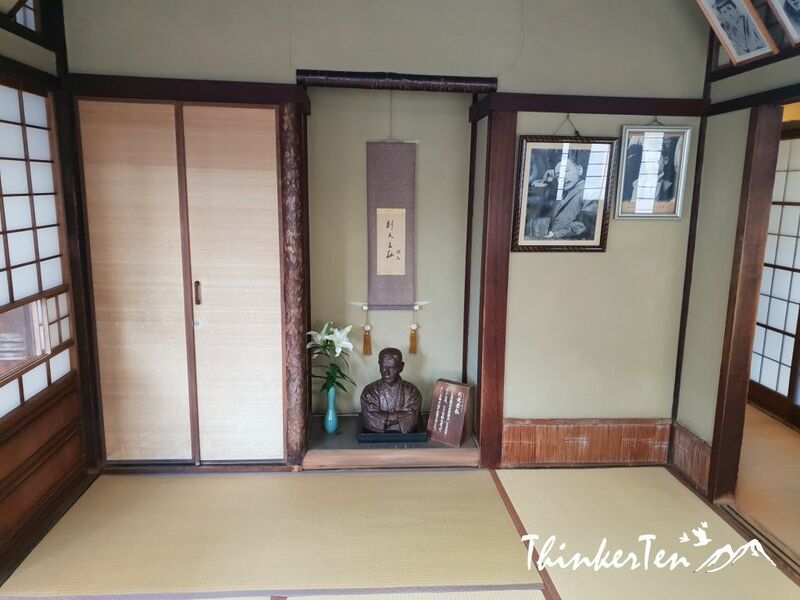 Located near Dogo Onsen, 10 mins walk. We passed by Isaniwa Shrine when we walked from where we stayed, Yukai Resort to Dogo Onsen. The shrine has a number of documents on Japanese mathematics displayed along its corridors demonstrating the popularity of Japanese mathematics among the local people of Matsuyama. 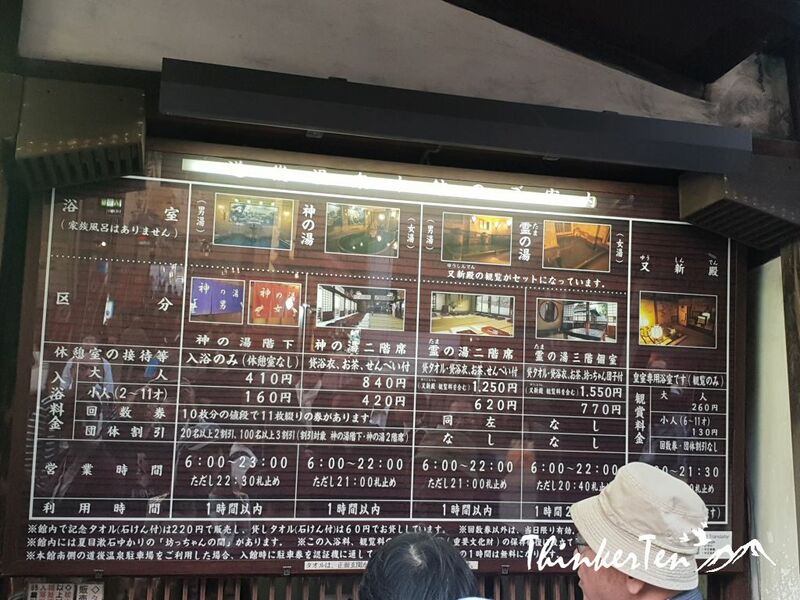 Matsuyama city boost thousand years hot springs bathhouse called Dogo Onsen. Tourists flooded here to soak in the hot springs which is believed to cure disease and illness. What made the bathhouse stand out from the rest is, it has a special bath area dedicated only to the Imperial family. Another famous thing to note in Matsuyama city is Botchan by Natsume Soseki who is the top novelist in Japan and his best masterpiece is called “Botchan”. Every Japanese has read “Botchan” novel during their school years. Natsume Soseki is so important that he was also appeared in the 1000 Japanese Yen note. He was considered the most profound Japanese writer in Japanese literature world. There is even a sweet called “Botchan Dango” and “Botchan Ressha” / Botchan Train named after his most famous novel. Do remember to try out the Botchan Dango sweet when you walk around in the shopping streets in your Japanese yukata/ bathrobe. Wow! Some amazing ideas right here. I just booked my trip to Japan in April – and I still need to plan things, so this is a great start. Matsuyama city is a small city compared to Tokyo and Osaka in Honshu Island but it is the biggest city in Shikoku Island, Japan 4th largest island. Shikoku Island is for people who has been to Japan multiple times. It is more of countryside and full of tradition in this island. Love all the photos! We love travelling in Japan. My daughter was there last Spring and she had a great time. The dongo and mandarin oranges cakes are so tasty. 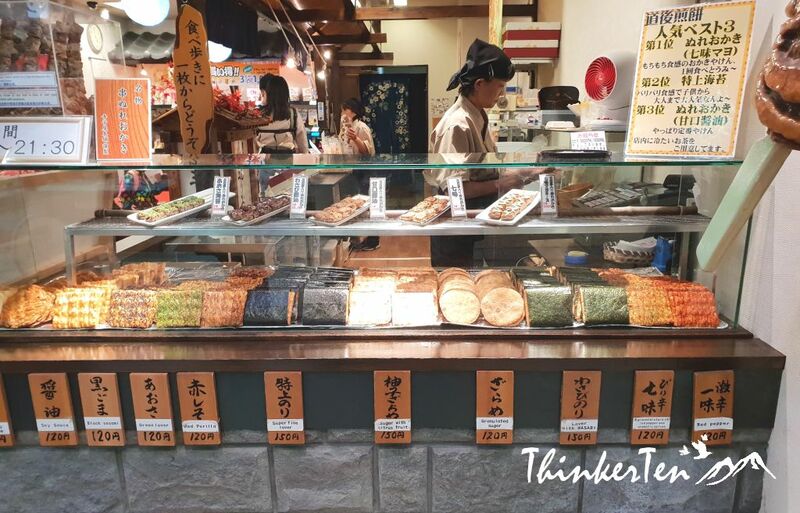 Japanese snacks are lovely to eat with green tea and the Botchan dango is one thing you can’t missed in Dogo Onsen. The place looks so great. Such great captures I must say that and your description is lovely. I was glad to finally made it to Matsuyama city and be able to see this town that was used to stayed by Natsume Soseki who is the most famous modern novelist in Japan. His famous masterpiece is called Botchan and the story get inspiration from his teaching experience in the middle high school in Matsuyama, Ehime Prefecture here. My daughter and I love to see historical sites and learn about it, this article was both. Dogo Onsen is get very famous in Japan as it is oldest and the only hot springs get visited by the Emperor. So there is a museum of where the Imperior family would rest after his hot spring bath. Quite interesting to see where the emperor bath and where he pee. Well of course the Emperor has his own private hot spring bath in a separate room on the top floor. This certainly looks like such a fascinating place to visit. I’d definitely have to check out the hot springs for myself. I am loving the sound of the sweet potatoes in sugar, yum! Hot spring bath is one interesting thing you need to try while in Japan. Everyone soak in the hot spring naked and no towel to be used in the water. Luckily the hot springs was separated with men and women. But ancient time ladies and men are soaking in the hot springs together, well of course naked. I’ve always wanted to visit Japan. it’s very high on my travel list! I simply adore Japanese culture. Shikuko Island sounds like a place I would visit. The hot springs are already calling me. 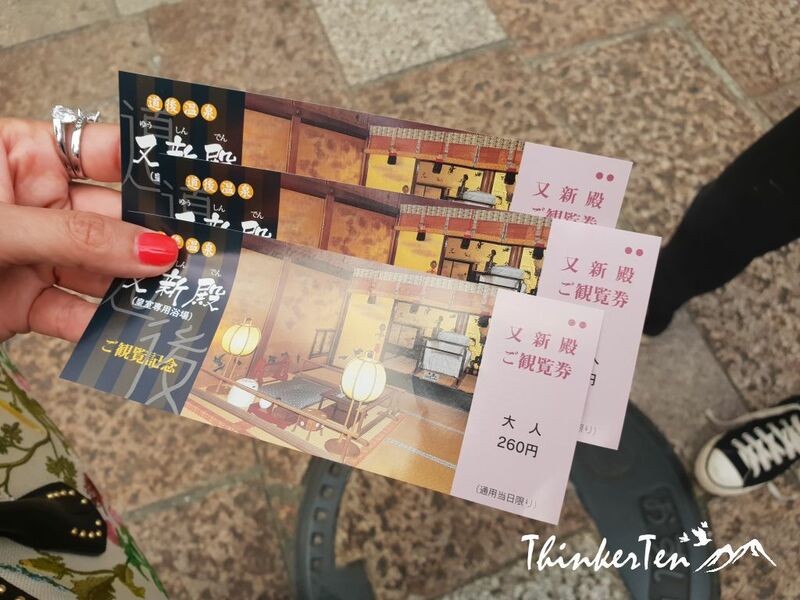 Dogo Onsen offer several package for the hotspring, the comprehensive package which include the Japanese traditional snacks & tea and resting area after bath plus renting of the Yukata/bathrobe. Sounds like an amazing trip to Japan that’s very much worth it. 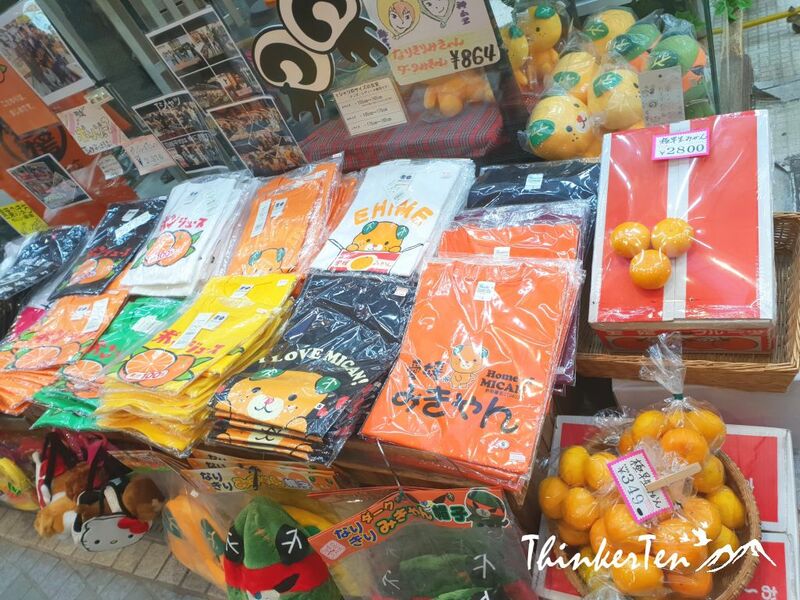 I’ve never been to Shikoku and this post makes me want to go there now. Shikoku Island is the smallest islands of the four main islands in Japan. People in Tokyo and Osaka think Shikoku is still very “inaka”/backward or countryside. But I still it is not that remote at all. The farm houses in Shikoku are still looking very modern and people are living quite close with each other. What a fantastic place. Japan is definitely on my bucket list. Now I just need to wait for the kids to be a little bigger so we can all go on an amazing adventure. I love learning about the history and difference from a new places. 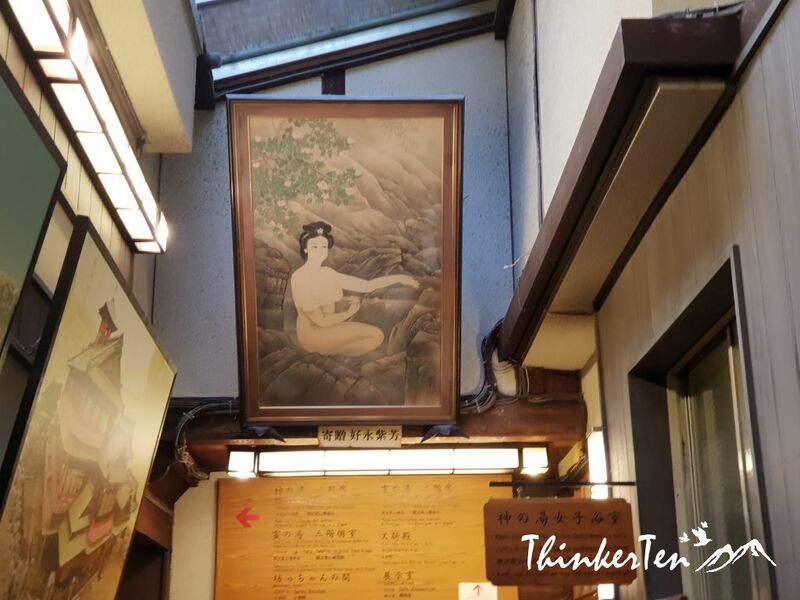 In Dogo Onsen, you learn about Natsume Soseki and the thousand years onsen. I loved reading your article and learning so many details about the traditions and the interesting things of thi sJapanese city! I’ve never been to Japan but I’d love to go one day! Japanese tradition is interesting even from an Asian point of view. Botchan is an interesting novel written by Natsume Soseki, the very important person in the Japanese literature world. He has described a lot of difference between the west and Japan in his novel “Botchan”. 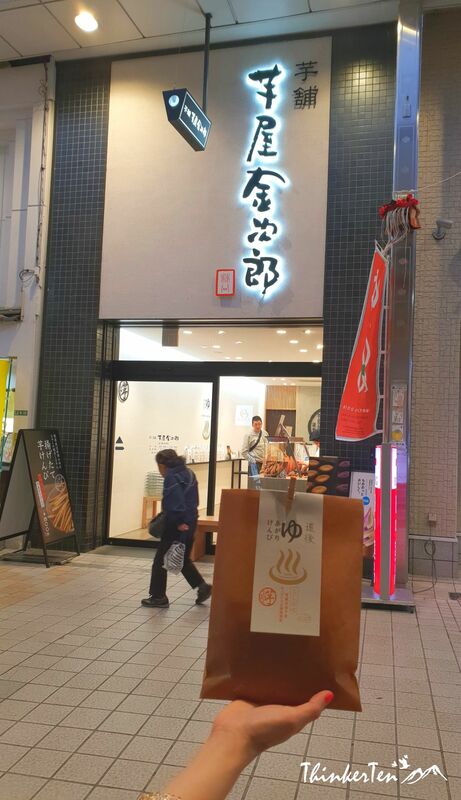 Dogo Onsen town has close relation with “Botchan”. I hope your husband will enjoy my write up on Shikoku Islands in Japan. Japan is indeed beautiful! I do love the cycling road : it’s indeed a cyclist’s paradise ! I wish I enjoyed cycling but of late, I don’t although that electric bike would be worth riding . Yes, the novel – Botchan is available in Amazon in English translation 🙂 Anyone who is interested in Japan would love to find out more from Botchan novel. The story Botchan is based on a real life experience of the author, Natsume Soseki when he was teaching high school in Matsuyama city. What a neat spot! 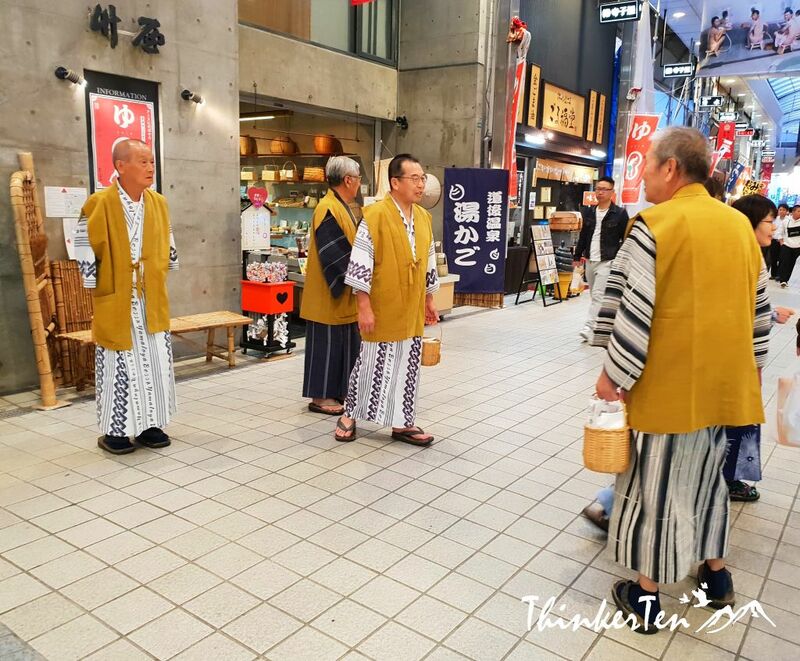 I especially loved the photo of the men in their Yukata shopping with their baskets! 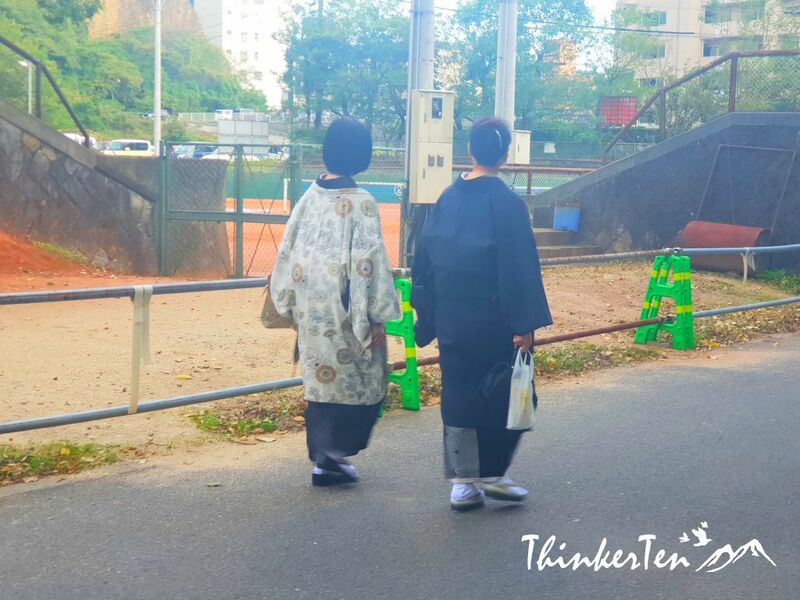 The Dogo Shopping street is the only shopping street that you see people wearing yukata after bath and walk around. Pretty cute.